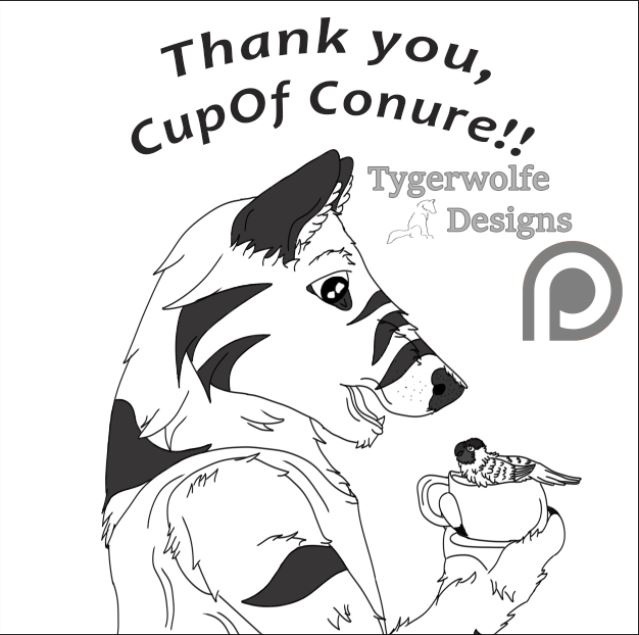 A huge thanks to my newest Patron, Brushfeather Artistic Creations, AKA A Cup Of Conure! And I'll take this opportunity to introduce my newest Patron offering - Thank You Doodles! ALL PATRONS - that's right, $1 a month (Omega) and up - get a free Thank You Doodle when they first pledge (and the payment clears)! These may even be colorized later, even if they're just Omega level. These will be more complex for higher Patron Levels, though. An Omega doodle will be black & white. At the next tier, it will be flat color, etc. Anyone joining at the highest tiers will receive a fully painted Thank You Doodle. These doodles may be inspired by usernames, other patrons you support, or just whatever random inspiration strikes me when you first pledge.